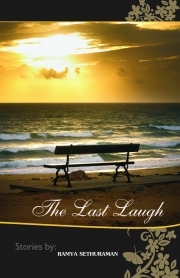 Description of "The Last Laugh"
Discover the romantic in you with The Last Laugh! Friendship, love and pathos form the theme of most of the short stories in this novel. The stories have an Indian touch to them but carry enough charm and sensitivity to appeal to a wide audience. The book is an ideal pick whether you are here for a quick pleasant conversation with the characters or a deeper study of their psyche and your own reaction to the events in their lives. Ramya Sethuraman is a software engineer with a penchant for telling tales. She loves to play with words and has a knack for creating special stories from ordinary, day-to-day lives of people. Her stories have appeared in DNA, Me magazine in Bombay-India, India Abroad newspaper in the US and has received special mention in the 76th annual writer's digest competition in the US. The Other Side by Kavita V. S.
Reviews of "The Last Laugh"